Here two gorgeous pieces available in Zara at the moment. The first one is a super pretty white blazer. It costs 49.95 GBP which I think is a bargain. 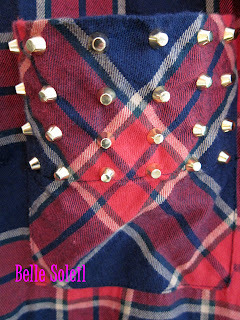 The blazer is very simple but has a pocket on each side which can be opened and closed with a zip. It is timeless, has a female shaped silhouette and a white/cream colour. 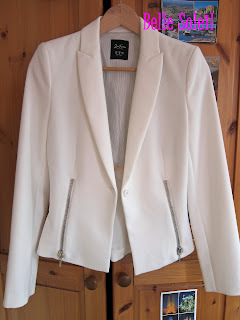 I think this blazer is amazing as it is so classic but yet stylish. It is wearable for formal occasions but also for a night out. I also think that it looks a lot more expensive than it actually was. I cannot wait to wear it..! 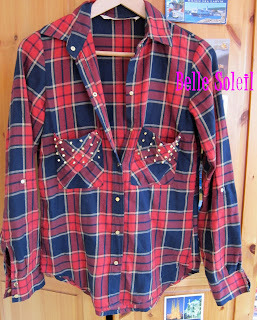 The second piece is a red and blue checked shirt with golden ornaments on the pockets. This shirt fits perfectly to a tight black jeans and black boots and I am really excited about it. It was a bit pricey, 39,95 GBP, but it is a real investment buy. I especially love the golden coned spikes on the pockets.